Baur voluntarily joined the Imperial German air force in 1915 and subsequentely shot down nine enemy aircraft, for which he was awarded the Bavarian Medal for Bravery. Under the terms of the Treaty of Versailles, Germany had to disband her air force and Baur started flying for commercial airlines like the Bayrische Luftlloyd and Junkers Luftverkehr. In 1926 he became one of Lufthansa's first six pilots. Shortly after having flown his one millionth kilometer, Hitler hired him as his personal pilot. He remained in Hitler's service right up to the end of the war and lived in the Führerbunker during the last days of the war. 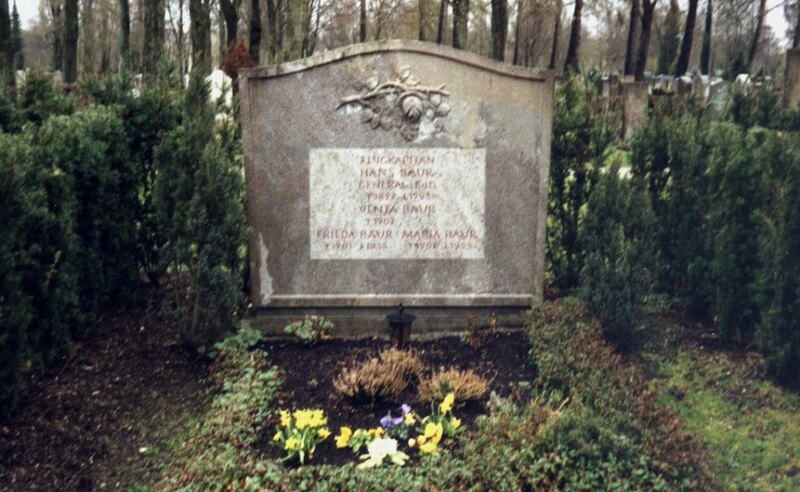 Hitler's last order to Baur was to fly Martin Bormann out of Berlin, but during their escape attempt on the night of 1 May 1945, Baur lost sight of Bormann (who, as we now know, was killed or committed suicide that same night) and was shot and captured by the Russians. His injuries were so severe that one of his legs had to be amputated. For the next ten years the Russians ruthlessly questioned him, because they suspected that Baur had flown Hitler to safety before the fall of Berlin. After his release in 1955 Baur returned to Germany, where he wrote his memoirs 'Mit Mächtigen zwischen Himmel und Erde' (1971). He is buried in the Westfriedhof in Munich.